I sift the earth, extracting slender green things with surgical precision. The garden is my heaven; in it, I play god, choosing what lives or dies. This is where I sift my thoughts, too, and comb the tangles of my life. The sun warms my back while I help a fat worm escape the demolition. Birds natter and scold. Butterflies dip and dance. I rub my nose with a dirty hand and shut my eyes. This peace, it’s balm to my soul. The healthy shrieks of my two young daughters shatter the moment. I quickly assess the sound. Little girl’s screams are, in my experience, classified by four types: the ear-splitting staccato of jubilant happiness; the guttural wail of anger/hurt; the shrill piping of terror, and the breathless squeal of shock/awe, which is a little like terrible excitement. The girl’s feet patter through the open garage with united purpose, their yells are peppered with hushed collaboration. Okay, so—not fighting. Scratch outrage. I watch them seek my outdoor haunts with systematic composure. No mindless terror present there, but—they aren’t happy either. The youngest spots me first, and they both rush to tower over me, babbling and gasping for breath. I relax. This is awe. “A bee!” the younger one exclaims. Her knees buckle and spring as she hops in place. “He’s chasing us!” The youngest tears up. You can only be brave for so long when you are three. My mind stumbles over this information. Wha . . .? 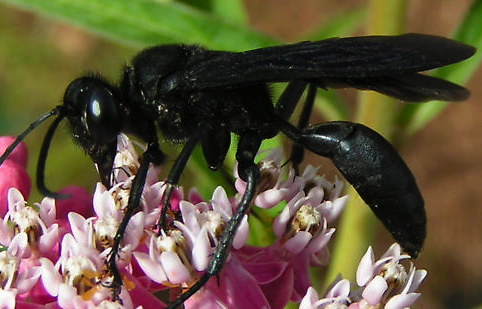 A black bee? Is there even such a thing? I sigh. “Show me,” I say, but I lead and they trail behind. They trip and giggle while pushing each other, intoxicated with the thrill of fear. “See? There!” the five year old cries out, triumphant. She points to the paladian arch over the sink. The ebony-colored insect crawls across the window, wavering in drunken circles and buzzing like a hive on steroids. This is no bee. Its sleek body, backlit by the afternoon sun, is the length of my smallest finger. The gloss of her graceful lines is an evil shine. “Wasp,” I whisper, though I have never seen one so large. Queen! my instincts shout, and the roiling in my stomach seconds that summation. Tired of listless wandering, the queen takes flight and dive bombs us. I suffer age regression, yelping and ducking with my children. She circles back, and we sway and scream like we are riding the tilt-a-whirl over a bump. We cower beneath our counter-top while the black bullet commands the air space. “What do we do?” the youngest asks, trembling. Both girls, wide-eyed, look to me to fix the problem. I know exactly what to do. “Time to call out the big guns,” I mutter. I shuffle across the kitchen like a soldier under siege, then grapple for my lifeline—the phone tumbles into my hand. He laughs. “Oh-kay. Is that it? I’m sorry.” His voice drops to a conspiratorial whisper, “We’re really busy today.” I hear him shift the phone and confer with a co-worker. My lifeline is leaving me adrift! I persist. “I-I think it’s a queen. It’s huge. And black and . . .” I trail off as he interrupts. “Wait! What about the wasp?” The unmistakable whine in my voice makes even me cringe. A pregnant pause that I’m all too familiar with fills the line. That short span of silence is one of many things that I love about my husband. Instead saying exactly what he’s really thinking, right after I do or say something stupid, he waits approximately four seconds—most likely filtering what he’s going to say, instead of giving me the reply I deserve. He clears his throat. “What did you want me to do—come home and kill it for you?” A hint of sarcasm colors his answer. “Of course not, that’s ridiculous.” Yes, I do. I really, really do. “Nope. I am,” I declare. They gasp and jostle each other. “Are you gonna use the vacuum cleaner?” the five year-old asks. I bite my lip, and shake my head. Vacuum cleaners are perfect fly traps, but the uncertainty of whether the wind tunnel and dust would kill a hardier creature weighs upon me. I have a ridiculous fear of insect vengeance. My vacuum sat out of commission for two weeks, the nozzle secured with plastic and rubber bands, right after I sucked up a three-inch wolf spider. I march to the dish drainer and grab an empty jar, at once smug. My husband, who decries my penchant for saving them, will be assailed of this virtue tonight. Above the sink, the queen has resumed crawling on the glass. With my heart in my throat, I climb the counter and poise. Can she see me? I lean close. She vibrates with fluid motion and humps the glass with her needle-tipped back—flaunting the weapon she can use at will. I quail at the thought of getting stung. My hand shakes. What if I miss? In my mind, she has supernatural speed and looms larger than my reach. A murmur breaks my confidence. I drop my hand and look down. Buoyed by my newfound courage, the girls have collected below and wait with hushed anticipation. “Get back,” I tell them between clenched teeth. “What if …?” They scramble before I finish. I return to my task and plunge the jar with swift aim. “You did it! You got her! Yay!” The girls clap and jump up and down. Mom has saved the day. But, wait. I didn’t think this through. She’s trapped—yes. But the blood rushing from my arm reminds me that I cannot lift the jar from the window without repercussion. The queen rails against her glass prison, flinging her hard-shelled body in every direction like a berserker military tank. Tap, tap, tap, thunk.Tap, tap, tap, thunk. “How are you going to get her off the window?” the five year-old asks. “Quick! I need an envelope.” The three year-old runs for the item, eager to help. Later, she will tell her dad she played an important role in the wasp’s capture. The arch is lined with pie-shaped grills that defy this simple task. I drag the queen to the widest spot and worry she will sneak through the minuscule crack as I slide the stiff paper beneath. I worry she will jab me through the thin vellum before I exchange my clamped hold for a metal lid. The queen knows this is her last chance for freedom and redoubles her efforts. The gap the envelope will leave while I transfer the lid is enough to give me pause. I shake the jar hard, knocking her to the bottom, and seal the top posthaste. The girls and I turn the jar, examining the queen in her glass prison. She rages, grating like an outboard motor, but she’s no longer a threat. I cup her in my hand and find pity. I stiffen—I can’t let her go. More than bug vengeance, reason tells me this critter’s particular purpose will not serve my home or neighbors very well. My shoulders sag. Suffering in a jar until she wastes away seems inhumane, but a quick death is no longer possible. The queen stops her frantic lashing and pants. I admire the elegant, albeit wicked, beauty of this creature—her only crime is that she is as she was made. She is a warrior, and a mother. A twinge of sadness weights my heart. I’m in no mood to sort this out. “Your father will know what to do,” I reply, and give the queen a temporary home in our cool garage. Later that night, my husband pokes his head in our bathroom. I’m dressing for our evening engagement and running late, so he only gets half my attention. I hear the snicker in his voice, and roll my eyes. “Um . . . in the garage. Somewhere.” I finish swiping mascara on my lashes and look up, but he is gone. We are en route to our event before I remember the queen. We have a long ride ahead, and I’m using the time to topcoat my nails. “Did you find the wasp?” I ask. I chew on this information for a bit. The last time I saw the queen, she was spitting mad. I can’t figure out how he got her out without getting stung, or her flying off. To further complicate matters, I can’t understand why he of all people would take the risk. Oh. Yes. That makes sense. Hadn’t I shook her myself to fell her from the top? But, I’m surprised as well, she seemed tougher built than that. He is quiet. I know this particular silence. I stop painting, and look up. He clears his throat and a rare blush stains his profile. “I torched it.” This statement is punctuated with a shrug. “You . . . What?” I am at once dull-witted. My brain stops and starts, sputtering—This does not compute. My husband helps me get there quicker. The words sink in. I envision the long-handled butane type used for the grill. Blood heats my skin. “You torched it?” I repeat. My voice rises at the end. “You burnt my bug?” I yell. The vehemence surprises me as much as it does him. Bewildered, I stare at the stranger beside me, attempting to reconcile him with the husband I know— the man who rescues our pond frogs, which, would otherwise be run-over because they like to party in our driveway when it rains; the man who maintains multiple feeders for wild birds and stray ducks; the man who roused me from a deep slumber to aid the seven week-old kitten who cried so piteously on our deck, and never left. He’s right, of course. A fatal allergy to stinging insects has marked his life with much angst. I think about my little girls and the variety of screams they use to convey their emotions. Women do that, too—in a more articulate fashion, of course. We rely on our voices, our sounds, or lack thereof, to express our feelings. My husband knows this, which is why my silence concerns him more than any words I might say. Mars and Venus are so different. Male quietude usually equals contentment. Venting is resolved, not with words, but physical expression. The boy in Home Alone faced fear with a baseball bat. John Wayne confronted anger with fisticuffs. College boys bump chests to show happiness. And if a boy wants your attention, well, depending on the age—there’s hair-pulling, tickle-prodding, or bear hugs. It makes sense. Traditional roles dictate that Venus nurtures and Mars protects. It’s a condition of how we are made. “Are you upset with me?” he asks. How can I be? Even I, in my garden, pull weeds. What issues have caused Mars and Venus to become unaligned in your home? What would you have done with the queen? First, may I just admire the beauty, once again, of both your website and your writing. Everything you do has such style and grace, D. Each time I read your stuff, I marvel. Ah-may-zing. Makes me so anxious for your novels. I know this takes place a quite while ago (the girl’s ages), but could you please give Mike a hug for me, for having to endure that silence in the car? I’ll bet he can recall it with instant and perfect clarity, as I can for those I’ve received from Mo. Wonderful stuff, D! I have a Big. Grin. spread across mah face, and some mist in my eyes for your beautiful praise. Thank you, thank you for your enduring support and your kindness. This post was hard to write, but your post, Taking The Longview , which deconstructed fear, really resonated with me. It gave me the courage to bare the truth and tell it. Much like you stated, I still think about your advice for focusing on the fear and using baby steps to confront it. Thanks so much, Lara! 😀 I really appreciate that you picked up on that reconciling bit, and thought to mention it. This story was terrifying to write. I knew, if I did it wrong, the perception of both my and my husband’s actions could be misconstrued in an unflattering way. As always your insight is spot on. Such a beautiful story, DD. I loved every minute of it. In fact, I found myself jumping at the sound of a fly hitting my window at the moment when the queen threw herself against the jar. I still feel as if a queen might be in my house! That’s powerful writing. My hubby and I are so different when it comes to bugs. I take bug vengence seriously but he likes to catch and release. He got angry one time when I washed a spider down the tub. We live in the UK, so there aren’t any poisionous spiders, but I’m from Texas ya’ll! When it comes to bugs I shoot first and ask questions later. You were brave. I don’t know what I would have done with the Queen. I don’t think I would have torched her though. Lol, Heather! I laughed, re: “shoot first and ask questions later.” You know the only reason I captured that wasp was because I feared I would miss with a swat! And then, you know . . . bug vengeance. I’m happy to know I’m not the only who fears it. 😛 Tsk, I’m still sort of annoyed that he torched it, too–but boys enjoy their science experiments. The cover of your new book, Pretty Dark Nothings, has me so intrigued I want to read it now! It’s like the gorgeous dessert on the buffet that must wait until after dinner. Wishing you all the best with it. Cheers. Great post and I applaud your bravery! In my house, ‘men are from Jupiter, that’s why they’re stupider,’ and it would have been up to me to save the day. After freaking out, I’m not sure what I would have done! Oh, Dee! Re: “Men are from Jupiter . . .” That’s sooo funny! I imagine you would have found a creatively funny approach to ousting such an unwanted guest, and then wrote about it in a way that would have us all laughing. 😀 Thanks so much for coming by. Great story D.D. and, as usual, beautiful writing. Interestingly enough I am the bug killer in our house (this might be due to the fact that my husband is gone so much), especially spiders. When my husband sees a spider, he calls for me (he might not like that I shared that:)). I save daddy long legs, I put bees back outside, all others that make it into the house get the fly swatter. There are too many other Mars/Venus issues to relate here, but all in all we seem to balance each other well. Thanks for sharing your story! You are so right, Nicole. Mom’s have to wear all kinds of hats when dad’s work involves traveling. I do kill spiders, etc. (well, I vacuum them mostly) but wasps were always my hubby’s territory (technically he didn’t relinquish that, did he?) I love that your hubby calls for you when he sees the eight-leggers, it means he considers you the expert, that’s all. Since you save the Daddy Long Legs, I’m betting he just doesn’t want to make an error. I’m looking forward to more of your mermaid story this Friday. 🙂 Thank you for coming by, and one of these days I want to hear how your novel Empyrean is coming along. I agree, Tracy! I wanted to swat it, but I was so afraid I would miss and then, you know, bug vengeance. I love your line re: silence. lol. The calm before the storm is usually me. 😛 Thank you so much for stopping by. Added note: I tried to leave you a comment on your new blog post, but I think they kept getting eaten, so here’s what I said: We share the same love of books– the crisp feel of a new page, or dogeared suppleness of an old leaf where others have journeyed before me. But, I love my kindle! There’s something kinda awesome about the portability of 35K books inside my purse. 😛 Enjoyed this post. I’m hopping over from GUTGAA and visiting some blogs before the fun begins! Nice to meet you and good luck with your blog! Gorgeous writing!! I just started blogging last month, so my blog is a frail, sparsely feathered hatchling constantly begging for food. Come say hi and feed it something, will you? I did! Love your witty answers– great voice. I’ll lay odds your writing resonates the same engagement. So pleased to meet you. 😀 And thanks for the follow, the internet food supply is scarce all around (lots of competition.) We fantasy wordsmiths must forage together.